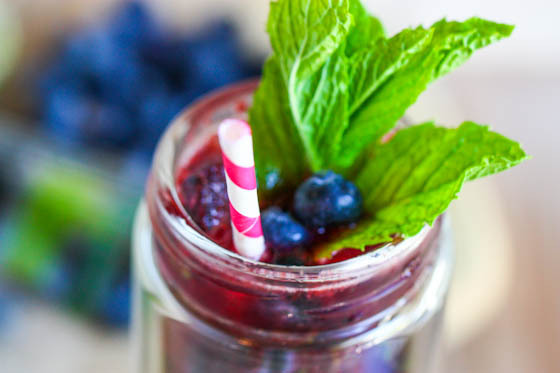 I made these amazing blueberry mojitos last Friday and I’ve been waiting ever so patiently to share them with y’all today. Truth is, I’ve been SO EXCITED and counting down the days to share with you guys this lovely little boozy refreshment. Blueberries were on sale and since I loved the cherry mojitos so much, I figured blueberry ones would be just as good if not better. And guess what? They’re better?! Well, maybe. The cherry ones were still really good, but these are just so blueberryish……they’ll rock your socks off. If you’re wearing any socks, that is! Truth: I never know what in the world to type for cocktail posts. I mean, how much can I possibly say about a mojito? It’s delicious. That’s all I know. Actually, I know that you should not walk, but RUN to your closest Banana Republic Outlet right now because on our drive home yesterday, I found the cutest little espadrille wedges on sale from $60 to $15! Naturally, I insisted that I put them on right there and then and continue to drive the remaining two hours home in them. After thirty minutes of sitting in bumper to bumper traffic, my little toe started to get numb. So I wore them….for the next hour. Then I finally kicked them off and only put them back on right when we were walking into Adam’s office. Like I said, I don’t know what to say during cocktail posts. It’s not like I slaved away hours in the kitchen to make this. But I did slurp it right down at 3pm right after photographing. All for the sake of the blog! I swear. It’s probably a good time to go make these now then. You deserve them. Combine the sugar and water in a small saucepot over medium heat. Bring to a simmer then stir to dissolve all sugar. Remove from heat. 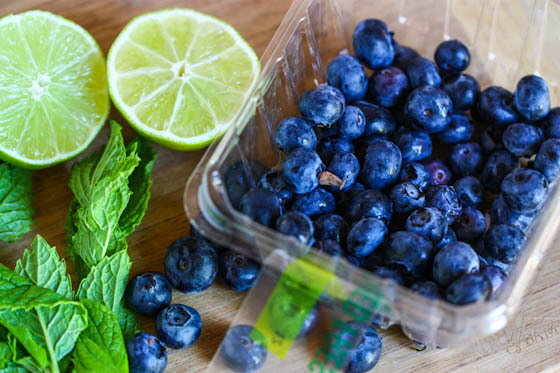 Carefully transfer sugar water to a blender and add fresh blueberries. Process until smooth but still slightly chunky. 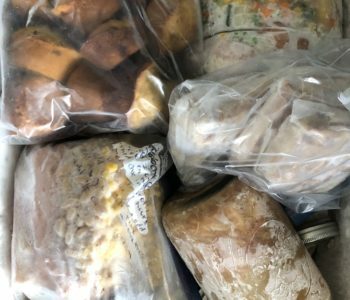 Remove and transfer to a glass jar or tupperware. Place in fridge and chill until cool. Blueberries will rise to the top and you can just skim them off when ready to use. 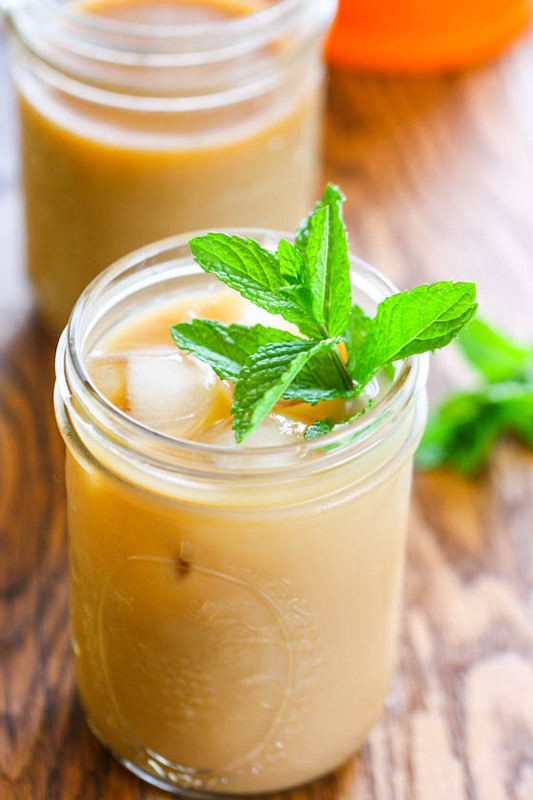 When you’re ready to make your drinks, place about two sprigs of mint in each glass. Squeeze a lime over top and muddle (mix around) with the bottom of a spoon. Then, add 1/4 cup blueberry syrup, 2 oz rum, and finish each glass with club soda. Let’s see the new shoes!!! I’m with Maja… SHOW US THE SHOES!!! I may need to take a minor beer break and grab one of these! They’re my favorite mixed drink! Oh and I already have BR outlet on my to-do list for tomorrow. I’ll keep my eyes out for wedges! 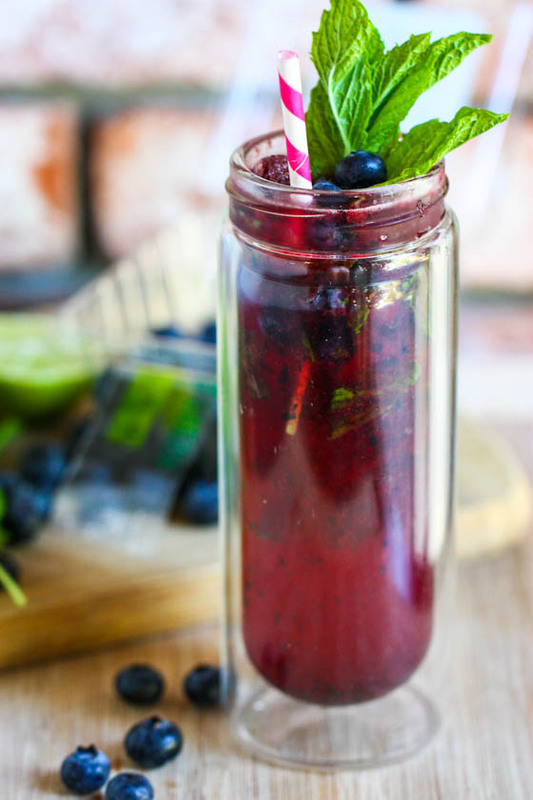 Love love blueberry mojitos, what a perfect summer drink! these sound incredible. I’m completely inspired. if I was to make these “virgin” I’d just add a bit more soda, right? Yum! The mojitos look perfect! As I’m sure your wedges did while you were driving. All in the name of good style! Sounds delicious. And I LOVE the glass it’s in! You forgot to tell us to put the booze in, but I think we all get the “jist” of it. hahaha Thanks for the recipe, I love mojitos and blueberries are always a fav! 🙂 Hope you’re having fun with your mom on her visit! I’m surprised you didn’t show us your awesome new shoes! Mmmmm…these look so sweet and refreshing! Perfect for a summer weekend!! This sounds like exactly what I need today! Love the color! sometimes the tastiest things take the least amount of time. i’m not a big drinker, but i do love the occasional mojito. this looks so fantastic! if we would ever get some sun back, i’d have to make these while enjoying the pool! I must wear new shoes immediately, too! Is that by chance a David’s Tea bottle I’m spotting there? Probably not, but I just couldn’t help but ask! LOL! This looks seriously yummm….I’ve never had a mojito before, but I think if I ordered one, this would be it. Cheers! Love the glass the mojito’s in! Where is it from? Mojitos are one of my favorite summer drinks! If we include fresh fruit, it’s usually watermelon (http://lollingabout.wordpress.com/2011/07/06/wasted-wednesday-watermelon-mojitos/), but with such gorgeous blueberries at our farmer’s market right now, I might have to make these instead! Just a bit confused, when I hit print for the recipe it said they were Blueberry Margaritas! Guess too many Mojitos may make you think you’re drinking margaritas. Can’t wait to try, , which is why I have a generous ‘patch of peppermint planted’ in my herb garden! Such beautiful drinks!! I can see why you were so excited to share them 🙂 Have a fab weekend! I love mojitos! 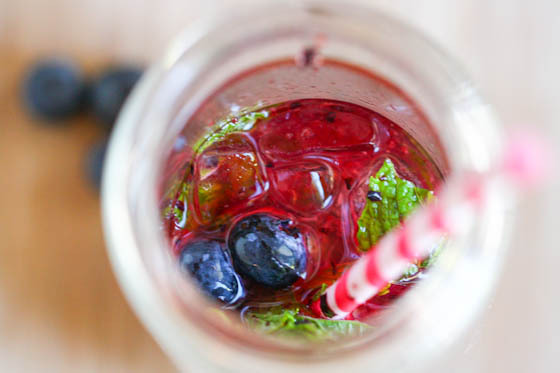 I particularly love mojitos that have been infused with fruit, but I’ve never tried a blueberry mojito before and it looks refreshing and delicious! Hope you had a fun trip to Carmel, I LOVE that place! These sound AMAZING. I’m a huge blueberry fan. I have blueberries and mint in my garden! Thanks for sharing! Oh, you might want to edit the print-able version, title says “Margaritas” and add rum in the directions after the blueberry syrup. My mom’s had a thing for ordering mojitos lately. I’ll have to make her one of these. They have blueberries, so they’re healthy, right?! Delicious! 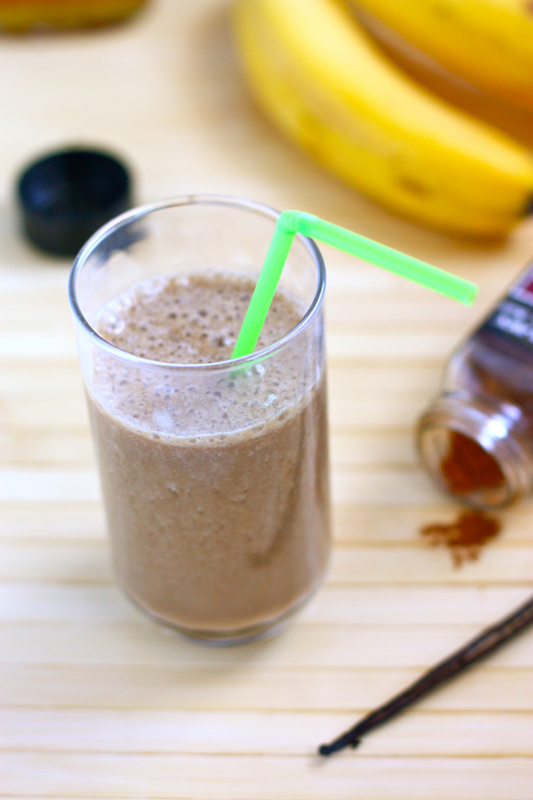 I dislike rum more than I can write, so I will absolutely make this with a different alcohol. thank you for my Friday night cocktail! cannot wait!! This is gorgeous Jenna, I adore mojitos. The colors in this are fantastic! Oh for the love of shoes 🙂 Is it sad I’ve never made a mixed drink before? Yes, I’ve decided it is. Maybe this will be my first! Thanks! I’m making these this weekend, that’s it. And I’m laughing at your shoe story, sounds exactly like something I would do! 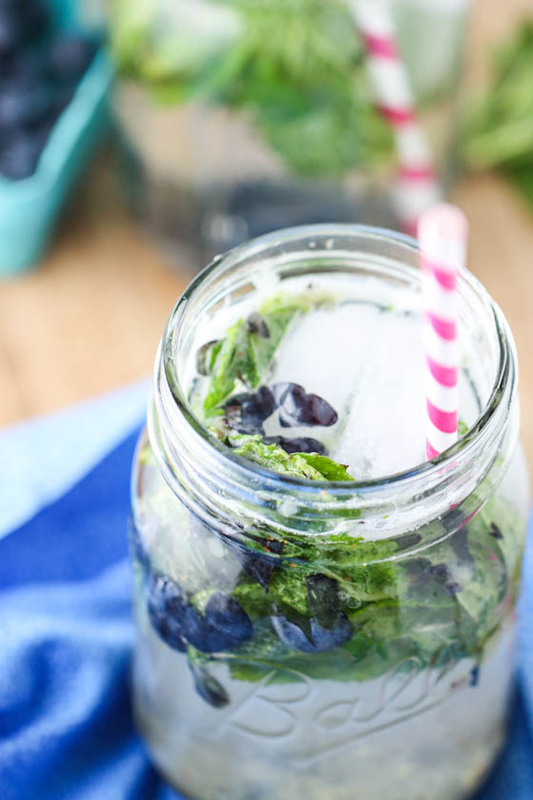 The blueberries definitely make this mojito an 11/10! Gorgeous pics, and I am glad you’re have a great time with your Mom! in love with this creation!! Also…. WHYYYY is there no Banana outlet near me??? Wahh. What gorgeous photos of a gorgeous drink! I want one of these today! SO good! 🙂 Doesn’t take too long to make either! Thanks Jenna for a great summer drink! 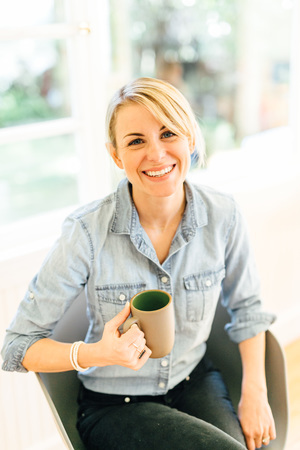 I am happy I found your blog on pinterest! 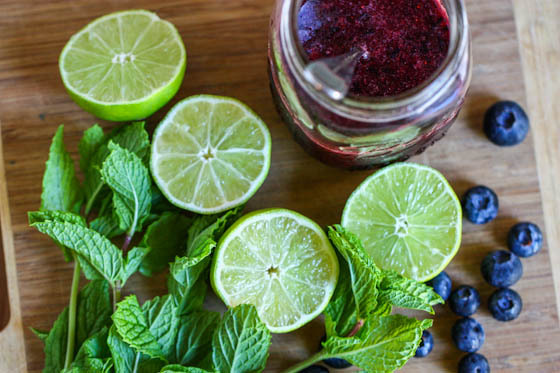 As I love blueberries I would love to make this mojito and I have already fallen in love with this even without trying it!